Body type: Square, natural strength. Family: Parents, but they’re distant. Only child. Likes: Visual media, being a hermit, cooking, surfing on various wikipedia articles. Strenghts: Curious and optimistic by nature. Weaknesses: Worries what others think of him, wants to avoid conflict by all means. Other: Mass-consumer of comics, movies and games. Nerdy guy who likes to escape to fantasy. 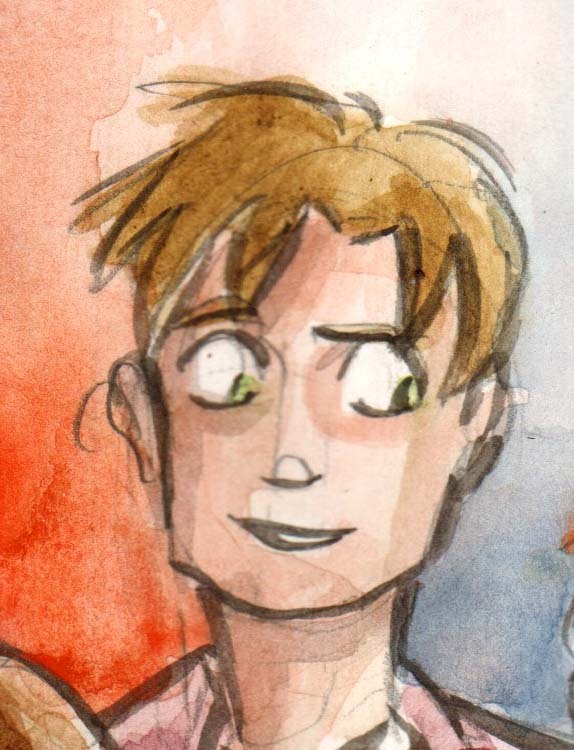 Levi may be a timid giant, but down to his core he is still full of childlike wonder. Lover of fantasy and fiction, Levi spends most of his time daydreaming, and can get careless about real life situations. He is kind person, who alongside living in some distant land, want’s to connect with others. Sharing movies, food and experiences with others is something he loves dearly. Levi yearns to be liked by others, but still stay true to himself, so instead of pretending, he just tends to shut off if things don’t go to his way. Easily excited, he usually tries to keep his cool to look more plausible for Susan. Levi has a strong yearning to be liked, which causes him to be fickle with his words and opinions, as he’s always keeping an eye of the reaction he gets from others. Always too unsure of himself, he tends to deal with confrontations pretty with either shutting people out or just lashing out. Sometimes this results in desirable situation (Sue leaves him alone) or a bit more disastrous (Nikita calling him out of it). Levi has few friends, as he likes people, but is shy by nature. Tim and Susan are his most noteworthy friends, but Susan grew distant and Tim passed away under uncertain conditions. Before this, Tim and Levi had a fallout when they were children. Afraid of what Susan would think of him, Levi didn’t back Tim up, when she was doubtful of the place he had found. This caused a strain between the three, that’s still haunts him. He is very fond of Amy, as they share the same interest and get along great, but Levi is a little afraid of her father, Carl. He considers Nikita as a friend and is very interested over what kind of creature he is, but is also worried of what Nikita may think of him.